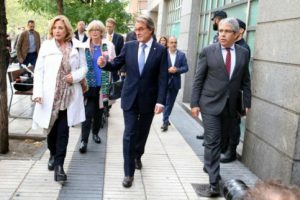 The former Catalan president, Artur Mas, three of his cabinet members and six other officials have been condemned to pay 4.94m euros for organising the 2014 unofficial vote on independence. Mas and former ministers Joana Ortega, Irene Rigau and Francesc Homs faced trial in 2017 and were sentenced to between one and two years barred from public offices, as well as paying fines of 24,000 to 36,000 euros. Yet while they were not found guilty of misuse of funds by the Supreme Court and the Spanish High Court in Catalonia (TSJC), a lawsuit by two civic organisations at Spain’s Court of Auditors has ended up in them having been found guilty of using public funds for the unofficial referendum, held on 9 November 2014. The former officials already offered their houses as a guarantee of a portion of the 5.2m euros deposit required in September 2017, and had previously paid 2.8m euros in October 2017 out of a solidarity fund created by pro-independence civil society organisations. The court has reduced by 300,000 euros its original demands. The verdict can now be appealed to the same court and, as a last resort, to the Spanish Supreme Court. Indeed, Artur Mas and the three former ministers involved reacted on Monday afternoon saying that the verdict is ‘a judicial outrage’ and they will appeal against it.